Finn & Cohen is very concerned about the safety of your sensitive personal information. We do not send such information unprotected in emails. The problem with email attachments is that a copy of the email and the attachments are left on every email server the email passes through. That copy may sit there for days, weeks, or months, all the while potentially exposed to unauthorized observers. Even if the file is encrypted, the file is exposed to attempts at cracking the encryption. To prevent this we use a service called Citrix Files / ShareFile. When we send a file through ShareFile, the file is never attached to the email; the email contains only a link to the file. 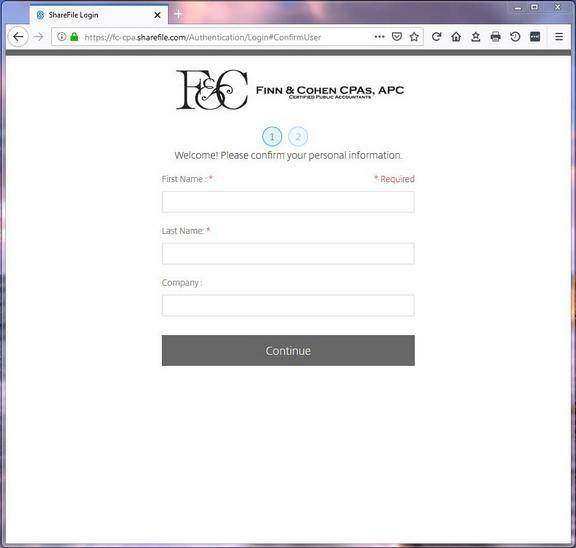 The file itself is directly uploaded from our computer to the ShareFile server over a banking-level encrypted (SSL/TLS 256-bit) secure connection. When you retrieve the file, you download it to your computer via the same level of secure encrypted connection. 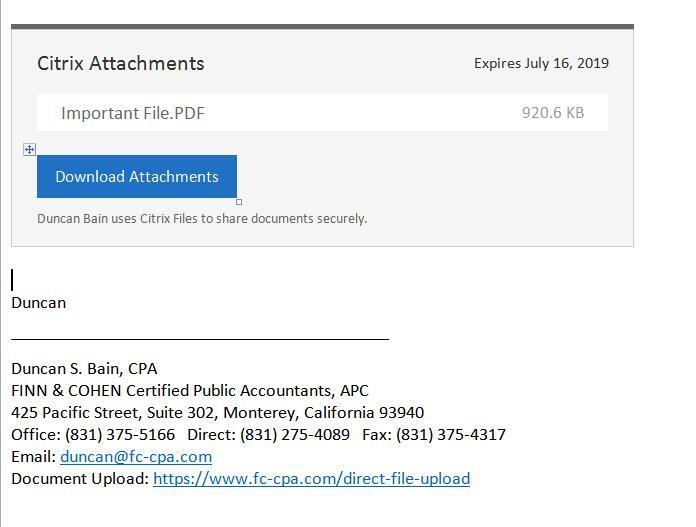 You’ll receive two emails the first time you receive a file delivered by ShareFile: one from your accountant that contains the link to access the file (or files), and one from mail@sf-notifications.com with a link to activate your account. You must activate your account and create a password before you’ll be able to access the files. 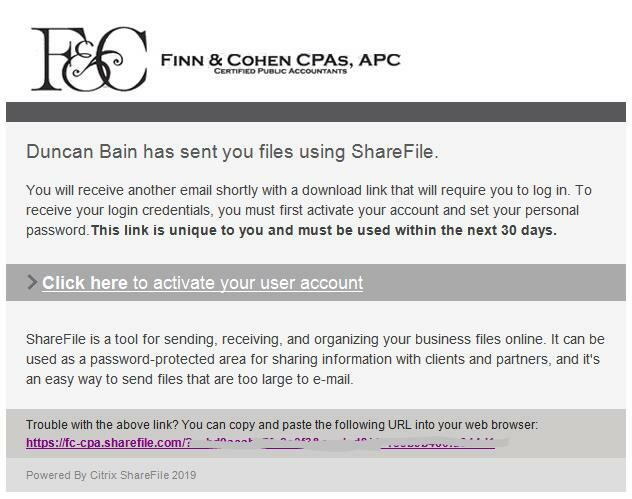 Note: if you did not receive the account activation email, click on the "download attachments" button on the email received from your accountant, then enter your email address and click on the "Forgot Password" link on the ShareFile login page. You'll receive another email with a link to activate/"reset" your password. 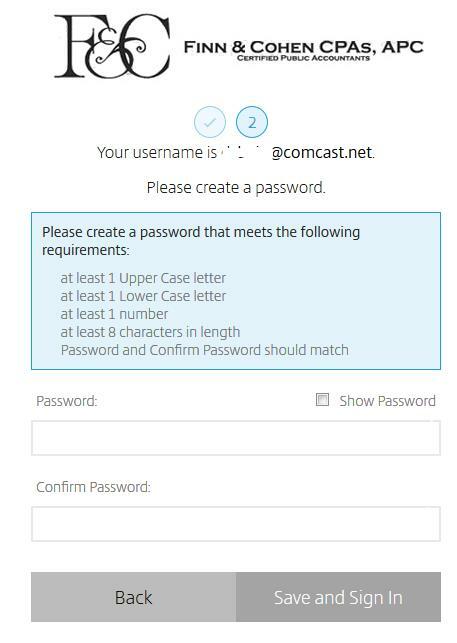 Create a unique password that complies with the rules displayed: the password must contain at least one upper case and one lower case letter, at least one number, and must be at least 8 characters long. For example, aBcdef99 would work, but abcdef99 would not, because there is no upper case letter. Your email address is your user name, and you will use the password you create to retrieve the files we send you now and in the future. You'll get to the login screen by clicking the "Download Attachements" link in the email we send to you. If you forget your password, you can click on the Forgot password link on the login page, and you’ll be emailed a link to reset your password.